Inside: Keep reading to find out how to make the very popular and delicious Indian food, Chicken Tikka Masala. 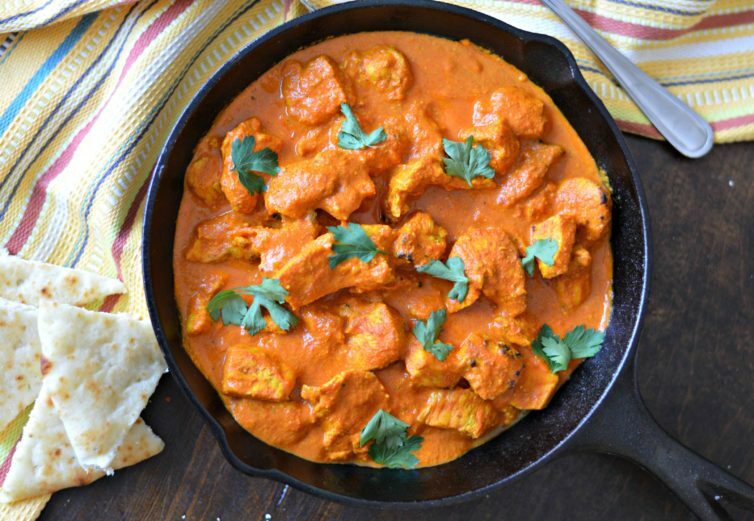 If you haven’t tried Indian food yet, you will want to check out this recipe. It is popular internationally and it is so delicious! The combination of spices and the way it is cooked makes it very unique, but at the same time similar to many popular Mexican dishes, including the addition of heat (spicy) which makes it even better. The first time I went to an Indian restaurant was a couple of years ago. I remember that it was served buffet style, which allowed me to try different menu items. The atmosphere was comfortable, and my first choice was Tandoori Chicken, which is similar to a spiced chicken dish that is common in Mexico. The next thing that I tried was a drink that was one of the most delicious that I have tried. It was called Mango Lassi, and I have since made it many times at home. After a few more minutes, it was time to try some more food, and from a distance, I saw a dish that reminded me of the home cooked meals that my grandma used to make for me growing up in Mexico. I couldn’t resist trying it, and I have to admit that once I started, I couldn’t stop eating it! 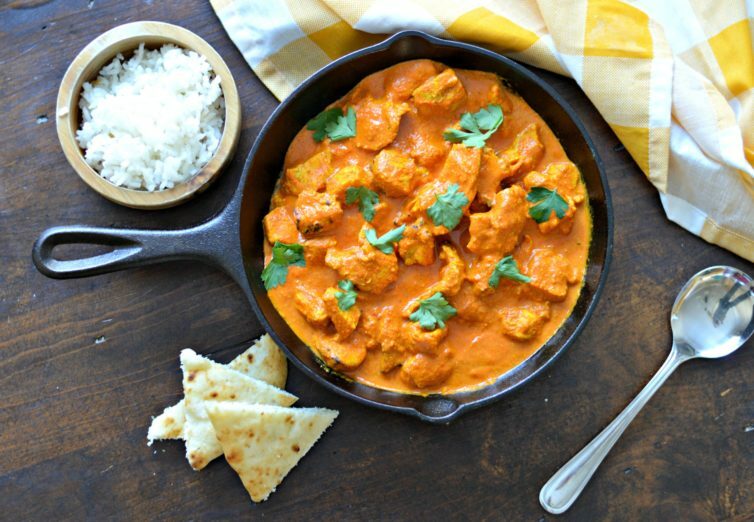 If you haven’t guessed yet, the food that I am talking about is Chicken Tikka Masala. 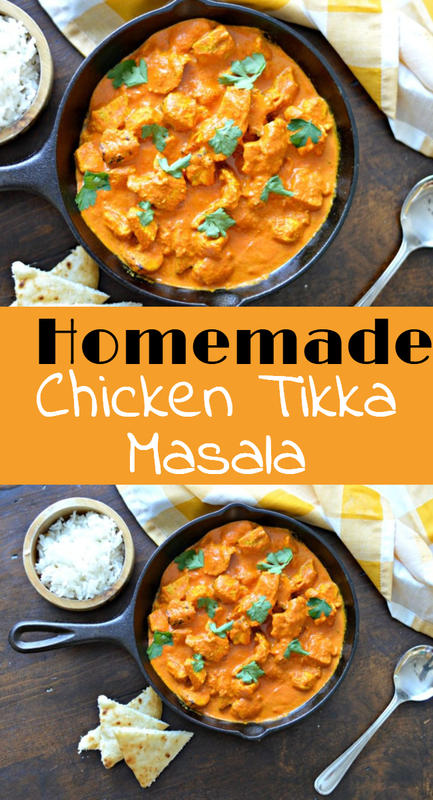 Chicken tikka masala is a delicious meal that includes marinated and grilled chicken, cut into cubes, and then served in a warm, delicious and colorful curry sauce. 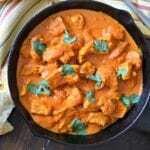 It is somewhat similar to this coconut chicken curry recipe that I posted previously, but the flavors are different. 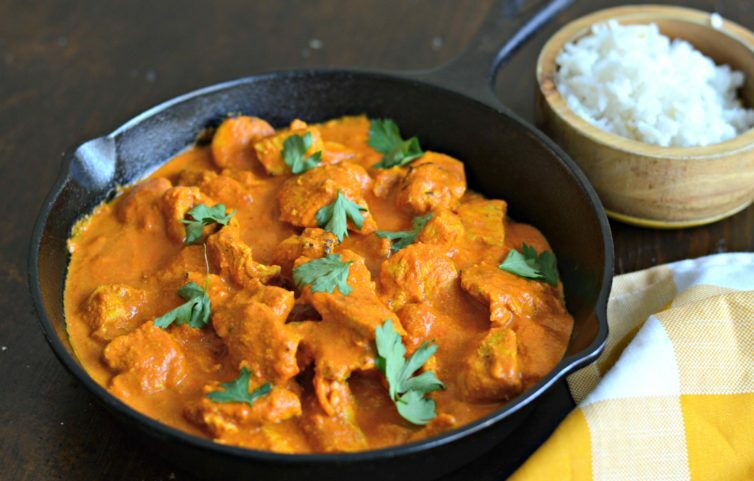 The color of tikka masala is somewhere between orange and red. It is very creamy with strong flavors as a result of the many spices that it uses. Tikka masala is very popular in India and some spices that it contains are coriander, turmeric, ginger, paprika, and a touch of cayenne pepper to add some heat. You will want to be careful with the cayenne pepper, because if you add too much it will be very spicy! 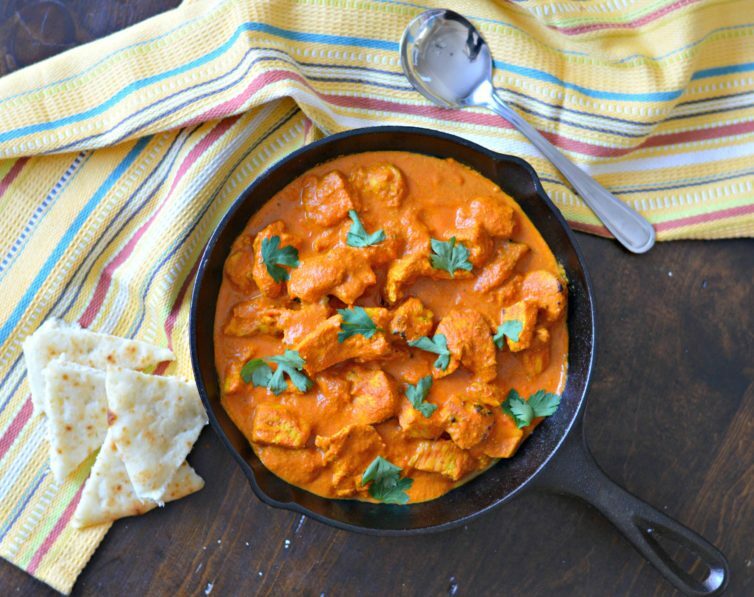 Tikka masala, like many other recipes, has been modified throughout the years, and many people add evaporated milk, coconut milk, heavy whipping cream, or yogurt to add an additional layer of creaminess. Of course! Like all recipe, this ultimately depends on what ingredients you use. For my version, I used fresh ingredients. I also used Gee, which is clarified butter that originated in India. It is delicious and is much higher quality than normal butter. 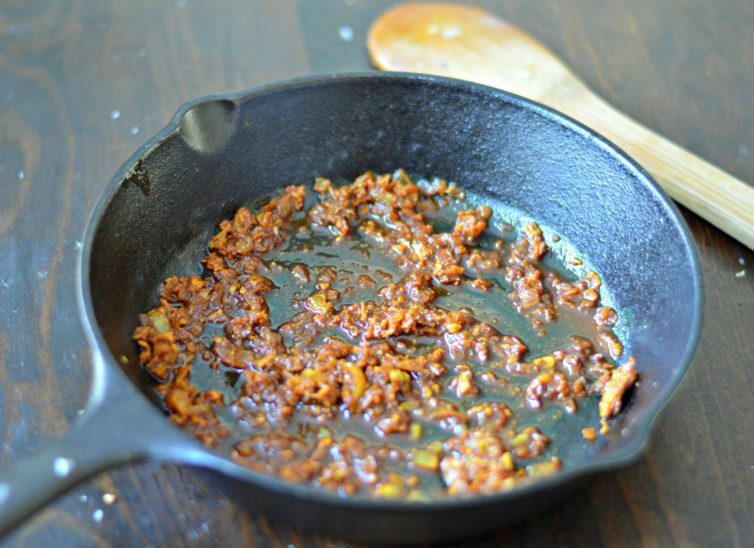 The combination of spices make this dish quite unique and I recommend that you follow the instructions for sauteeing the spices first in your skillet. Trust me, your kitchen will smell fantastic! If you are vegan or vegetarian, you can modify this recipe by replacing the chicken with tofu, or you can just use other types of roasted vegetables and serve them in the same sauce. I am sure that it will be delicious too! A few days ago we went out with a few other couples to celebrate our dear friend’s birthday. Fortunately, she chose a local Indian restaurant. Of course, when I saw chicken tikka masala on the menu, I had to order it. I wasn’t disappointed with the flavor, but I ordered the medium version. When I asked the waitress what scale of spiciness the medium had, she said it was a 2 out of 6. Of course, being Mexican, I wasn’t too concerned about it being too spicy so I went ahead and ordered. When it arrived, it was actually much spicier than I anticipated, but even still, I couldn’t stop eating it. Of course, I had to take some breaks to calm the heat with the fresh mango lassi and delicious naan. Make sure you try this recipe and let me know how it turns out! 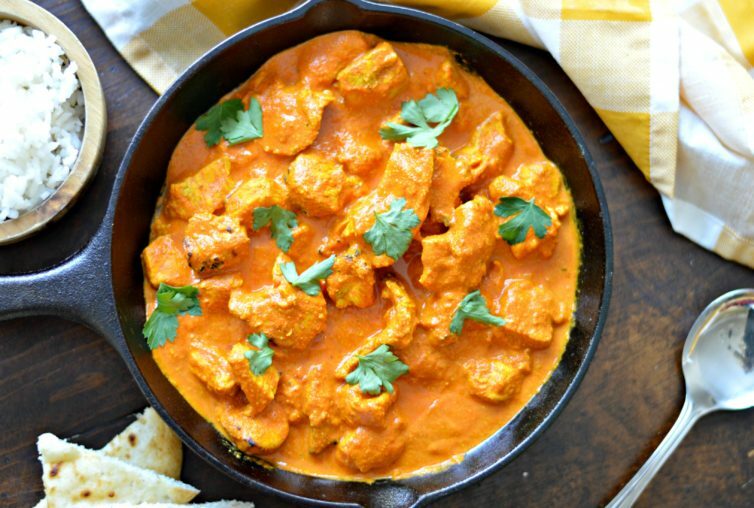 Keep reading to find out how to make the very popular and delicious Indian food, Chicken Tikka Masala. Combine all of the ingredients in a plastic bag or a large bowl with a lid. Shake the bag or stir everything together and let it marinate all night. Add the ghee to a hot skillet with the onion and saute for about 3 minutes. Add the ginger and cook for one additional minute. Add the garlic and let caramelize over medium heat for approximately 5 minutes. Add the rest of the spice and the tomato puree and let reduce for approximately 15 minutes. At this point, you can use an immersion blender or a standard blender to blend the sauce so that it is extra smooth, although this is not required. Add the chicken to the skillet with the sauce and let cook for 10 additional minutes.